NurseJoe's Marine Camo Lab Jacket is Ground Breaking. You already have a White Lab Jacket. Now be the First to Wear a Camouflage Lab Jacket . Click Here for More Information. The Original ACU Rank and Name Tape Ready Scrub Top is made with military grade fabric! Only at NurseJoe.com will you find the Real Battle Tested ACU Scrub Top. Made in America. Now Unclassified and Available to The General Public. NurseJoe's Delta 4 Scrub top is designed for warm climates. Whether you are in a fox hole in Afghanistan or on the Sandy Beaches of Miami Florida -- You will always be Cool & Comfortable. NurseJoe's Desert Camo Scrub Top is a military grade smooth textured nylon cotton blend top with four high utility pockets. NurseJoe's Fit & High Quality Construction is All American. Not Available in China! The Desert Digital Scrub Top is made from a soft cotton nylon blend that adds extra comfort to a truly Battle Engineered scrub top. The Fit & Construction is American cut,sew and design with attention to comfort and durability. Ready for Action! The Drone Force Scrub Top-(Air Force) is Ready for Take Off! High quality military grade fabric and top flight construction. Matching pants available upon phone or email request. Forest Digital is an authentic military grade nylon cotton rip stop garment. It is ready for action in any forest terrain around the world. Not just for Healthcare - it Looks Great Anywhere! OCP Camouflage is trending. 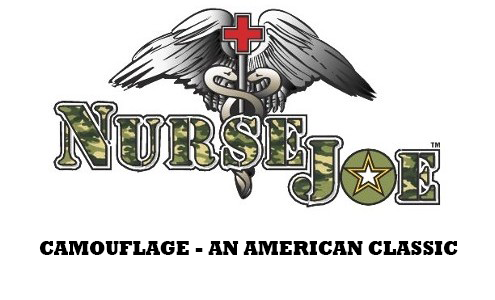 NurseJoe has this Camouflage available for all Americans for a limited time. Own a piece of American Wartime history. Support Our Troops with OCP Scrubs. Matching 5 pocket cargo pants available. NurseJoe's Sea Borne Medical Scrub Top reflects a proud connection to Navy operations around the world. The Woodland Camo Scrub Top is back to join us at home,work,or play.This is the New Flannel! -- The Fit & Construction is American cut,sew, and design with attention to comfort and durability. Matching pants available by phone or email. This military grade camo top is tan and grey with white spots that look like Oreo cookie chips. Like the Snow Leopard this shirt is at the top of the food chain.